You’re on graduation wishes, page 1 of 8 graduation wishes, messages and quotes. See related page menu at bottom of this page. 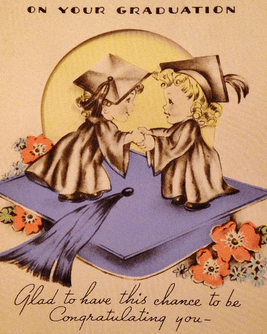 Peruse some graduation wishes for the new graduate. Yes, there’s lots to choose from. But, take a look and see if you find something you like. Now that you’ve graduated it’s now up to you to take that knowledge and do something great with it. Congratulations! Take some time today to think about what you learned outside the classroom. You’ll probably find that much more valuable than what you learned in it. With love and pride today and always. Looks, brains and now a degree? 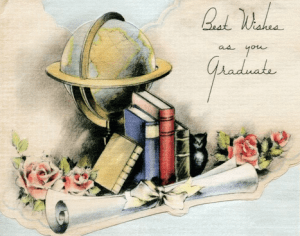 Watch out world – this grad has it all! Congratulations! Though you may now consider yourself learned, always remember that it’s important to remain a learner. Make learning a lifelong practice. Graduating is not the end of hard work – it’s just a break before you get into the new and bigger challenges in life. Good luck! Graduation is a time for celebration, a time of reflection, and a time look ahead. Wishing you a bright future. I knew you could do it, and I am proud of you. Congratulations! I never doubted even for a moment that you would make it. Congratulations for making us proud! You did it! You’re on the right path to a wonderful life. Congratulations graduate! It’s clear you’re on the way to the top! Stay humble and remember us normal human beings. If you’re wondering how the last four years went so fast, you should see how quickly the rest of life flies by. Enjoy this moment. Congratulations. Just remember that like college, all things that are worth it take time and effort. Continue to follow your dreams. 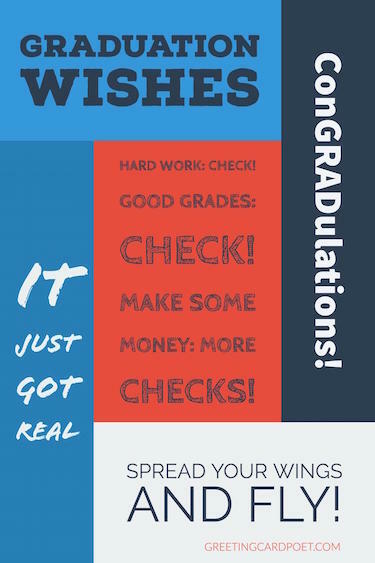 This site is a resource for friends graduation wishes, family graduation wishes, sister graduation wishes, brother graduation wishes, niece graduation message, nephew graduation greeting, son graduation wishes, daughter graduation wishes, nurses graduation wishes and more. Also, graduation wishes for college and high school. Congrats on getting through the easy part of life! High school is so last year. May your great college memories last longer than your student loan payments. My deepest condolences on the end of your school life. Call it graduation, call it commencement or in your case, call it a MIRACLE! Congrats — now you’re old. They say school is like toilet paper – you only miss it when it’s gone. Just think: now you get to add some initials after your name on official publications. No Child Left Behind really does work! Grad: you can’t imagine the sense of relief we’re feeling right now. I always sensed you would barely graduate. Congratulations grad! Congratulations to me for sitting through that long graduation ceremony. Graduation equals smart people wearing stupid hats! Just remember, bosses don’t accept notes from your mother. 4 years, 3 books, and 210 keggers! Congratulations big shooter! Hip hip hooray for the graduate! Congrats on your outstanding achievement! Graduate to the finer things. Congrats buddy! May today hold the promise of many great tomorrows! Proceed with great purpose – but, first take some time to enjoy! We’re so proud of the woman you’ve become. A time to remember and a time to celebrate. Let’s get this party started! An investment in yourself that will pay huge dividends. Graduation is only the beginning! The sky is the limit! Best wishes for your future! Congratulations! Serious accomplishment; silly hat! You go girl! Congratulations! We are very proud of you. Congratulations! Your accomplishment and hard work has paid off. Our pride inside is about to burst. Well done graduate! Congratulations! You’ve shown that you can be a successful student. Now be sure to continue to be one in every aspect of your life. Pursue your dreams and reach for the stars! You can do it! The world ready for someone like you! Continue to learn as a life learner, and you’ll graduate life successfully. Be glad, be a grad. We wish you courage as you steps towards new challenges in your life. Congrats. You get to wear a funny hat. All your hard work has paid off, and now the hat is yours. Congratulations. Your most significant learning from college: 24 hours in a day, 24 beers in a case. Bam! You have not only graduated from high school. You have graduated into adulthood. Wishing you the best things in your future to come. Congratulations graduate. You once had a dream, but today you’re an achiever. Congratulations on this very special graduation day! You studied hard and showed us how it’s done. Congratulations on your graduation. We’re so proud of the person you’ve become. It’s official: you’re now too cool for school! Your combination of hard work, effort and passion enabled you to fulfill this dream. Congratulations. Your graduation is a momentous occasion that you will remember for the rest of your life. Congratulations and here’s to the next step! Check out our messages for occasions like birthdays, weddings, anniversaries, and more. Dear (fill in name), you have made your family and friends very proud. I wish you the best of luck for the future. Hats off the graduate! You not only graduated, you did it with flying colors! You’re the best! Four years have gone by and you just keep getting better. You’ll be graduating to the finer things! It’s a time to learn, grow, and share. Congrats! Today is your day, graduate! Today we celebrate your achievement! You’re now hotter by one degree! Now this is the part where you find out who you are. Never forget your alma mater. Pursue our dreams with your whole being. Your dreams will all come true! Chase your dreams and continue to pursue excellence where you go. Congratulations! Education is a remarkable tool – It enables you to do wonderful things that can catapult you to great success. Congratulations on your graduation and all the best for the future. Getting up early for class, going to bed late after assignments, stressed by exams – but now all your effort and determination has paid off Congratulations! Graduating is certainly a milestone but life is the biggest learning experience of them all! Congratulations on your accomplishment. We are so proud of all of what you’ve accomplished. March on! The promise of future success is just around the corner. To old friends and new beginnings! Success will be yours. Keep on keeping on. Always take pride in your work! Congrats! 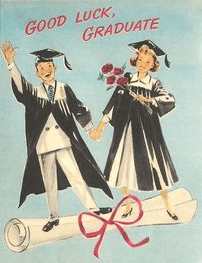 Switch the tassel to the other side – you’ve done it! The future just called and it’s waiting for YOU! Today we celebrate your achievement. You deserve all the accolades! Take time to remember and a time to celebrate! As one experience comes to an end, another begins. You’ve done great and you’ll do great! I really didn’t know what to do for a few months – I felt that I had let the previous generation of entrepreneurs down – that I had dropped the baton as it was being passed to me. I met with David Packard and Bob Noyce and tried to apologize for screwing up so badly – I was a very public failure, and I even thought about running away from the valley. But something slowly began to dawn on me — I still loved what I did. The turn of events at Apple had not changed that one bit. I had been rejected, but I was still in love. And so I decided to start over. About a year ago I was diagnosed with cancer. I had a scan at 7:30 in the morning, and it clearly showed a tumor on my pancreas. I didn’t even know what a pancreas was. The doctors told me this was almost certainly a type of cancer that is incurable, and that I should expect to live no longer than three to six months. My doctor advised me to go home and get my affairs in order, which is doctor’s code for prepare to die. It means to try to tell your kids everything you thought you’d have the next 10 years to tell them in just a few months. It means to make sure everything is buttoned up so that it will be as easy as possible for your family – It means to say your goodbyes. Stewart and his team put out several issues of The Whole Earth Catalog, and then when it had run its course, they put out a final issue. It was the mid-1970s, and I was your age. On the back cover of their final issue was a photograph of an early morning country road, the kind you might find yourself hitchhiking on if you were so adventurous. Beneath it were the words: “Stay Hungry. Stay Foolish.” It was their farewell message as they signed off – Stay Hungry. Stay Foolish. And I have always wished that for myself. And now, as you graduate to begin anew, I wish that for you.